The perfect way to start your day. Whether you call them pancakes, flapjacks, or hotcakes, this delectable breakfast will put a smile on your face. From Snohomish cafes to cozy Seattle restaurants, there’s something delicious in store for you at these places. 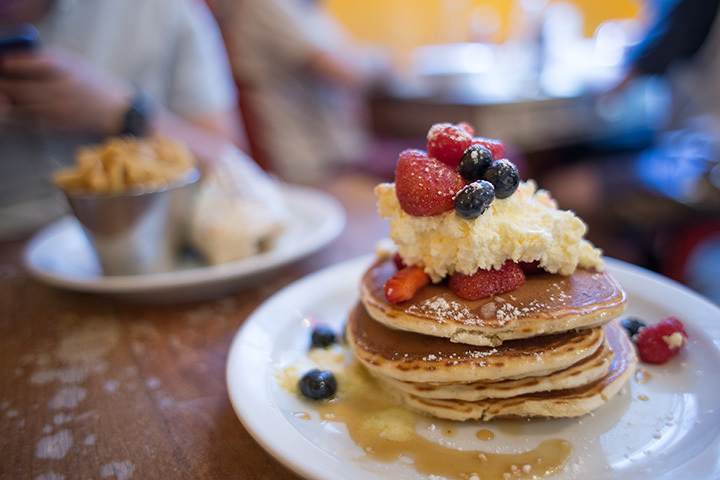 Here are our favorite pancake spots in Washington. You’ve heard the question, “why did the chicken cross the road?” In Bellingham, if chickens did cross the road, it would be to come to Homeskillet because they’d know their eggs would be included in the best breakfasts around. This is good food and lots of it! Breakfast is served all day long, so you can get favorites like a stack of hot cakes and organic maple syrup or homemade cinnamon French toast. It’s never too late to learn something new, especially when you’re being “schooled” in a unique way. Maltby Café is a turn of the century school-gym-and-cafeteria-turned-diner that serves breakfast all day during the week. They’re doing something right because they’ve been the winner of the Western Washington’s best breakfast for 25 years straight! Everything is good here, but if you love pancakes, try the fruit-filled Swedish version topped with a crème fraiche. You’ll never look at pancakes the same way. Meat eaters, vegetarians, folks who like to get up early and those who like to sleep in. Everyone can be satisfied at Geraldine’s Counter Restaurant. Served all day, customers rave about the fresh flavors and comfortableness of this busy diner. Family-friendly and easy on the budget, try the Jammin’ Slammin’ breakfast featuring ricotta pancakes, bacon, and eggs cooked to order. You’ll want to lick your plate clean when you eat at Wild Huckleberry’s in Wenatchee. Breakfast is offered all day and there are so many great options, the only problem you’ll have is deciding what to try first. From the expertly made eggs Benedict to the made-to-order omelets and giant buttermilk pancakes, this will be your new favorite place to eat. Don’t let the small size of Mr. T’s Family Café fool you. This place is large on everything from belly buster breakfasts to savings for your wallet. Homemade biscuits and gravy, veggie-filled omelets, big-as-your-plate-pancakes, and everything in between on the comfort food menu, these folks don’t understand small servings. If you’ve been looking for an old-time diner, look no further. Why go out to eat breakfast when you can fix the same eggs, toast, and coffee at home? Because you’ll get a unique experience at The Old European like fresh German breakfast sausage, a choice of European hot beverages like salted caramel coffee, or hearty buckwheat pancakes served with syrup and fresh blueberries. Gluten-free options are available for those who prefer it. Serving breakfast and lunch daily, eating at Valerie’s will feel like you’re eating at a friend’s house. No matter what you order off this traditional American menu from the biscuits and gravy to one of the specialty scrambles or a griddle breakfast featuring large, larger, or giant pancakes, you won’t be going home hungry. The Kettle is exactly what you think of when you think of a typical American breakfast and lunch diner. Located in Enumclaw, you won’t be disappointed with this little gem. The portions are great like the big-as-your-plate pancakes and the prices won’t leave your wallet empty. Check out their brunch for the best of breakfast and lunch items. Large portions, great service, and a nice menu selection of breakfast and lunch items is what you’ll find at Strawberry Patch Café. They focus on what they do best—breakfast, and it’s served all day every day. Besides classics like bacon and eggs, biscuits and gravy and the like, they have pancakes, French toast, and Belgian waffles topped with fresh fruit. Try the Lemon Poppy seed pancakes drizzled with a cream cheese glaze and candied lemon peel for a special treat. Once you eat at Dulin’s, you’ll understand why they’ve been voted the best breakfast and lunch place in the city. This charming little corner diner has an international flare with Irish, French, Greek, Mexican, and American takes on everything they offer. They have a seriously good stack of whole grain pancakes and the expresso is worth noting.